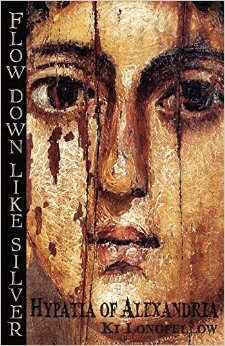 REVIEW: Flow Down Like Silver: Hypatia of Alexandria by Ki Longfellow – BOOK HARDER. First, a short introduction: Flow Down Like Silver incentivized me to create this blog. Apart from an enthusiastic following on Goodreads and similar book review websites, Ki Longfellow and her works receive scant attention. I’m sure there are reasons for this neglect, some of which might be valid. Nonetheless, it roused me to share some worthy options that exist outside of Bestsellers lists. After all, who actually reads the bajillionth review of All The Light We Cannot See (a book that, by the way, I adore to a probably unhealthy extent)? … No one raises her hand. With that said, I’m happy to cast a little more light on less conspicuous works, beginning with Flow Down Like Silver. The novel centers around Hypatia, a Greek scholar who lived in Alexandria, Egypt at the end of the fourth century. During this period, Christianity became the Byzantine Empire’s official religion. Hurray for Christians. Woe for everyone else (including Hypatia and her family). The first few pages throw the reader into a chaotic scene. Byzantine soldiers and religious zealots destroy Alexandria’s acclaimed library and all that Hypatia holds dear. Fortunately, she rescues a few books and hides them away for posterity. More trouble ensues immediately—family strain, self-doubt, doomed love, betrayal and, ultimately, death. Now that you’re thoroughly depressed, let me explain why this book is not actually depressing. What struck me was Longfellow’s use of language, which is incredibly poetic. So much so that I had some difficulty adapting to her writing style at first. I delved into the book expecting something akin to a Ken Follett novel; instead, I got a biographical novel written in free verse. My adjustment only lasted about ten pages. Then the real enjoyment began. Longfellow writes from multiple point of views, with each chapter devoted to a different person. This technique mobilizes the plot without complicating it, as there aren’t many protagonists. Note that Flow Down Like Silver is not a plot-driven book. It may not even be a character-driven book, despite its focus on Hypatia (fellow readers might disagree with me on this one). It’s more of an ode to a time, a place, an admirable but lost vision. While reading, I felt as though Longfellow channeled Hypatia. Real emotions poured out through her words. Every paragraph seemed carefully crafted. As such, Flow Down Like Silver can’t be fully appreciated as a speed read. It’s a novel to be savored. Despite several periods where I had to force myself to slow down, I prolonged the end; not because I knew Hypatia’s brief life ended in tragedy, but because I was comfortably cocooned in the story Longfellow weaved. And I’m not trying to be cute when I say “cocooned.” Upon finishing this book, I felt refreshingly empowered in a “YEAH, WOMEN! I’M A WOMAN! I CAN DO ALL THE THINGS!” kind of way. I basically transformed into a WonderWoman butterfly! Although Longfellow doesn’t have an obvious feminist agenda, she does portray Hypatia as a woman with more modern (or I guess “westernized”) ideals in the ancient world. It’s still a struggle to maintain modern ideals nowadays, but back then? Yikes. Now for a caveat: if you’re searching for historical fiction in the vein of Philippa Gregory or Hilary Mantel, I don’t recommend this book. “But it’s about a real woman in a real place during a real historical period!” you exclaim. OK, first of all: calm down. While all this is true, the summary misleads you. The writing style and plot flow in Flow Down Like Silver are patently different from that found in Gregory’s or Mantel’s work. Secondly, facts are scattered few and far between. If you want to learn details about Alexandria during Hypatia’s time, or about Hypatia’s accomplishments, better pick up something else to avoid disappointment. TL;DR: I recommend Flow Down Like Silver for readers who appreciate a slower-paced story with quality prose and a historical setting.